OUR SURFBOARDS ARE MADE OF PINE AND HAND PAINTED. They are not made of Plywood. They are all Hand Painted NO Vinyl Decals or Stickers. THEY WOULD BE PERFECT FOR. OUTDOOR PATIO RESTAURANT NURSERY TABLE TOP. BAR TOP HEADBOARD BUSINESS SIGN LOGO OFFICE. WEDDING GUESTBOOK ANNIVERSARY RETIREMENTS BAR TOP. TABLE TOP TOWEL RACK POOL SIDE. - 71" x 11" x 3/4. 47" x 11" x 3/4. 60" x 11" x 3/4. 71" x 11" x 3/4. Classic -- 71" x 16" x 3/4. OUR BOARDS ARE FOR DECORATION ONLY. DON'T TRY TO CATCH THE BIG ONE. THE BOARD MEASURES 71" LONG x 11" WIDE x 3/4 THICK. IT COMES WITH 3 COATS OF OUTDOOR GLOSS SPAR URETHANE. IF YOU WOULD LIKE TO USE IT AS A TABLE OR BAR TOP PLEASE CONTACT ME. I WILL ADD EXTRA CLEAR COATS FRONT & BACK. IT COMES WITH HOOKS TO HANG IN THE POSITION YOU WOULD LIKE. PRICE DEPENDING ON SIZE BOARD. 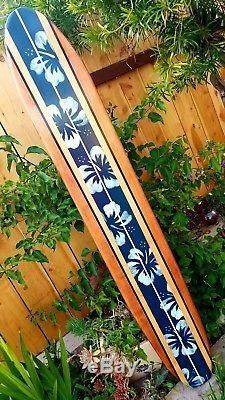 SURFBOARD WALL ART Hawaiian surf beach hibiscus decor longboard tiki sun" is in sale since Wednesday, April 11, 2018. This item is in the category "Sporting Goods\Water Sports\Surfing\Surfboards". The seller is "hbroux" and is located in Santee, California.